The Ford Toughest Ticket Sweepstakes 2018 is a Ford Sweepstakes sponsored by both Ford and the NFL where one lucky fan will score a VIP trip for two to Super Bowl LIII. 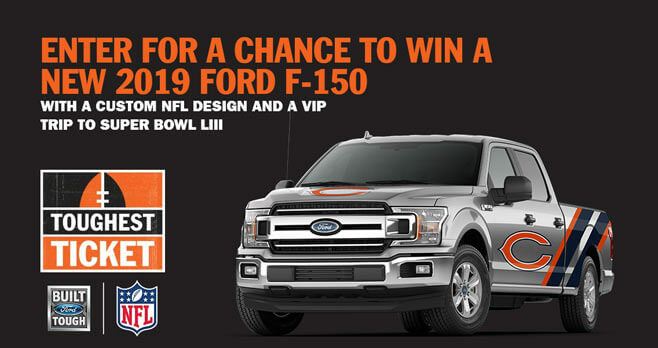 Visit either FordToughestTicket.com or www.nfl.com/toughestticket and you could also drive home a new 2019 Ford F-150 with custom NFL design. Eligibility: The Ford Toughest Ticket Sweepstakes is open only to individuals who are legal residents of the 50 United States and District of Columbia, 21 years of age or older with a valid driver’s license at the time of entry. Promotion Period: The Sweepstakes begins at 12:00 AM ET on 9/5/18 and ends at 11:59 PM ET on 1/20/19. Limit: ONE (1) ENTRY PER PERSON OR EMAIL ADDRESS, REGARDLESS OF THE METHOD OF ENTRY. Prize(s): The grand prize consists of a 2018/19 Ford F-150 customized with NFL graphics a VIP Super Bowl LIII Experience for two (2) in February 2019.